Today’s world of work is often a cacophony of meetings, hallway conversations, overloaded inboxes, and paperwork floating in all directions. It can be hard to keep track of everything going on when the pace is fast, things are constantly changing, and there is barely time to think. Especially if you don’t have a good note taking process. Throughout a typical day you may be covering a wide variety of topics. Issues get raised, nuances are uncovered, new information is obtained, and understandings of some things become clearer (or, in some cases, a bit murkier). Keeping track of it all is daunting. But capturing, tracking, and organizing all of this information effectively is crucial to your work. Many of your contributions will depend on your ability to efficiently process, analyze, and synthesize this information. Being able to weave together the big picture and how all the details fit together is important to shaping your work, and to your leadership contributions at any level. I’ve known this simple truth intuitively from early on in my career. But I’ve struggled mightily to find a way to be good at it. One problem was that, in the moment, I always felt light I would remember all the important bits. But then I would move on to a hundred other things and much of it ended up lost in the shuffle. Another mistake I made a lot was to overestimate how easily I could find information when I needed it. Digital files, inboxes, and even calendars are magically searchable, so I was comfortable that I could always easily retrieve whatever I needed whenever I needed it. But searching doesn’t always work so magically. More often, it’s a frustrating quest which digital pile to sift through, what keyword might get a hit, and which version of the document is the latest/right one. I needed to find a better way, especially as my responsibilities grew and as the world just got busier and busier. The best system for you is any system that you will use consistently, even if it’s imperfect. You should devise a system that works well for you by copying other systems and adjusting to your needs and style. That’s what I will offer up today, some of the best ideas for organizing work. You can copy whole systems or simply pick and choose the elements that you like and put together your own little system. The benefits come from deploying your own approach consistently over time. As it becomes second nature, you will hardly spend any time or effort to keep up with it. Yet you will get tremendous time savings and other benefits. Another note of caution, don’t worry about retrofitting all of your stuff into whatever system you might develop now. There is probably limited value to re-organizing 10 year old emails or documents from projects that were completed long ago. Think about moving forward in the most organized manner possible. You are setting up for a better future now more than trying to reorganize the past. Of course, it will make sense to re-file some things that relate to your current workload or a recent project, but don’t feel like you need to get bogged down in the past. As a consultant, project leader, and executive, I have run and participated in all kinds of meetings over the years. And I have used lots of different tools. Remember the Palm Pilot with its stylus and Graffiti shorthand writing recognition? Yeah, I did that. I’ve used tablets and notebooks. I’ve organized notes in documents and specialized systems like Evernote. There are a lot of electronic options these days. But I’ve gone all the way ‘round and back to handwritten notes. 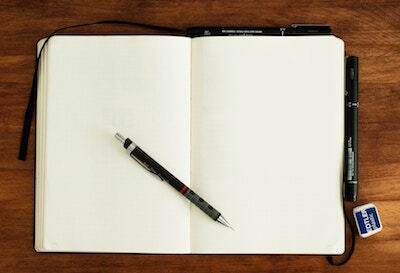 There is just something fast, flexible, and efficient about pen and paper. And it actually works better too, in terms of cognition. Science backs me up on this. For me, pen and paper are faster and easier. There is not boot-up time. No menus to sift through. No batteries to die out. Everything just works, every time. Of course, this also means that there is no backup and that I physically need to track my notes and have them with me when I need them. 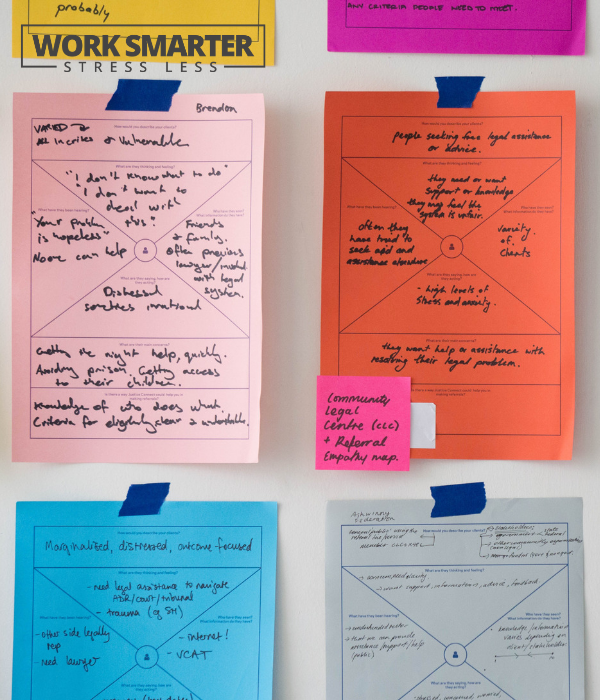 This was a big problem when I used to grab different notebooks for meetings, use loose leaf paper, and try to pre-organize and reorganize paper notes as I worked. Eventually, I landed on using a single bound notebook for all meeting notes. I take a single bound notebook everywhere I go for work. As each day progresses, that’s where I write my notes. When a meeting starts, I write the date at the top of a page. I write the topic of discussion and who is in the room. Then, I write notes as the meeting progresses. I’ll jot down main points, maybe sketch out a diagram, list questions raised, and maybe itemize next steps. For any action items I need to follow up, I draw an open checkbox next to it. That makes it easy to see at a glance later on things I need to follow through on. That’s it. I don’t get any fancier than that, simply because I don’t end up following through with any fancier system. It doesn’t really add value for me. What makes this simple system work for me is that everything is in one place in chronological order. There are no loose papers to lose. There isn’t any folder or tagging system to work. Yes, I risk losing the notebook because there is only one copy, unlike a digital file. But simplicity and ease of use win out for me. Plus, with all my eggs in this particular basked (at least for a while), I’m pretty careful to keep a close eye on it. There’s also more to the story than just recording notes. Having a bedrock of a consistent and complete set of notes organized chronologically is a great way to establish a foundation. But that’s not the end of the story. The reason we take notes is because we will need to do something with them. There is always some processing to be done. What I like about having the base notebook well established and complete is that the processing doesn’t always happen right away. The notebook makes it easier for me to be ready to take this next step, even if it doesn’t happen for a while. At some point, those notes translate into work. Maybe I will need to put some information or tasks into an electronic system to collaborate with others. I might need to write up a report of some kind. 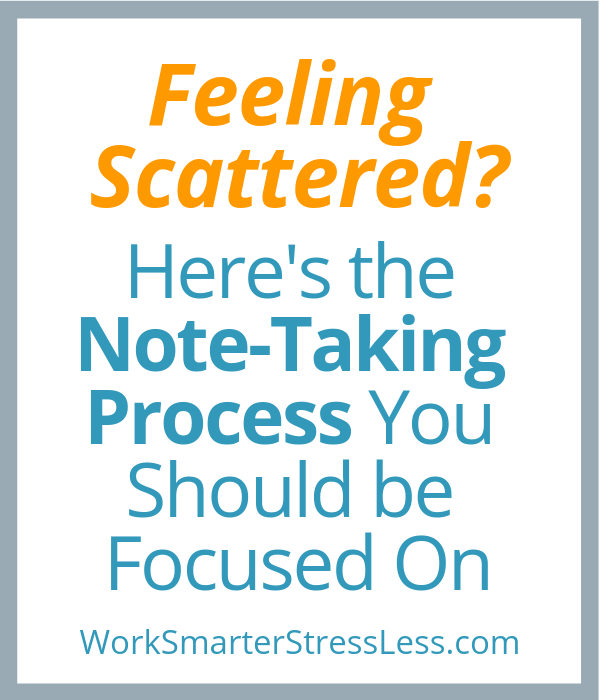 The notes could spawn some emails, phone calls, or additional meetings. 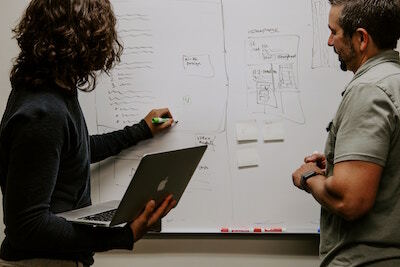 Often, this is a matter of jotting additional details into the notebook, creating additional open checkbox items for more tasks to follow up on, and crossing things out that are completed. But sometimes, particularly for the larger initiatives and projects that span some length of time, the notes need to be synthesized into a more cohesive story. Here is where I go electronic again. In order to plan an effective strategy, it is important to look back, synthesize lots of details, and make an assessment. This is the point where I find it helpful to open up a word processing document and consolidate my notes, which may have been collected over some period of time. Once again, I keep things simple and setup an outline format that is easy to adjust on the fly and to organize in different ways as the information is collected. With that framework based on my notes, I can go on to dig through emails, look back at my calendar, and review other documents to start to piece things together. As I work through this process, I usually discover connections that weren’t super obvious previously. I may affirm things I was pretty sure about. But, more often, the process raises questions and identifies gaps. That gives me a great roadmap of the most powerful and productive things to focus on next in order to complete the picture. Even better, putting this draft document together makes it easy for me to solicit input from others. I may need you to check my thinking, point out gaps I still don’t see, and help fill in details. The document I’m building makes this collaboration easier. More importantly, it helps me to socialize the topic, stimulate critical thinking by others, and build a shared understanding. This can really help to shape strategy, garner momentum, and facilitate further communication. Importantly, the document also serves as a more comprehensive summary for the record. Which doesn’t seem important until it is. Somewhere down the line, however, it will be important to be able to articulate the who, what, when, how, and why of your project. You will need to declare success, deal with an issue, or seek approval for the next phase. Maybe you will also need solid information (a great story) to fill out your annual self-appraisal for your performance review. For a whole bunch of purposes, having a complete and thoughtfully edited summary of thinking and action on this project, initiative, topic will be a great asset for you. 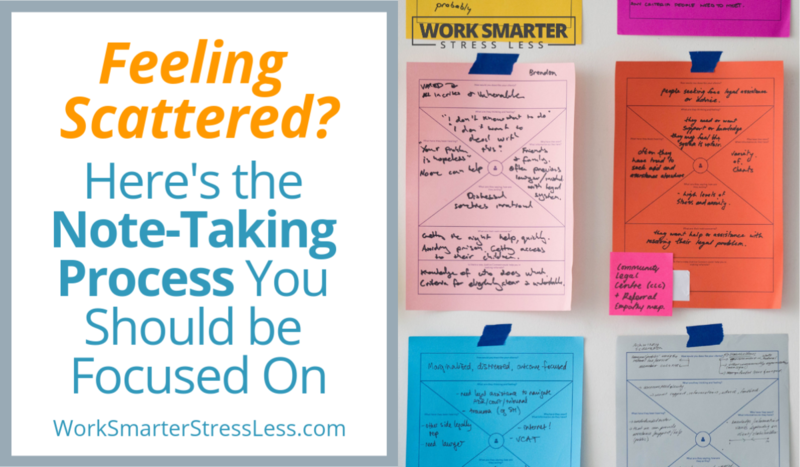 You might feel scattered and frustrated trying to keep up with everything that is going on in your work life. As an information worker, though, information is power. Getting it well-organized is a huge advantage. The best system in the world is whatever system works for you. You might like paper or electronics. You might benefit from fancy tools and intricate tagging systems. Whatever the case, the fundamental process that can help is to collect, synthesize, and revise all that information so that you can leverage it more effectively. I like paper notebooks and a simple chronological organizing system. That’s what helps me to collect information as I scramble from one thing to the next. Next, I shift to an electronic format to synthesize it all. It helps to create separate documents for each topic or project. 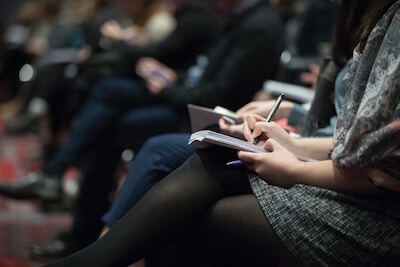 I love to build an outline format to organize lots of disparate pieces of information, including pieces I dig out from email threads and various other documents or places. Finally, the real magic happens when I revise everything I’ve got by finding and filling in the gaps, soliciting feedback and input from others, and socializing the ideas at the same time. All of this works to my advantage as it keeps me organized, thoughtful, and generally on top of things. That sense of mastery and control is very powerful. You can do the same. Perhaps you will use different tools and techniques. But the basic process of collecting, synthesizing, and revising should help you take all of that effort to the next level. 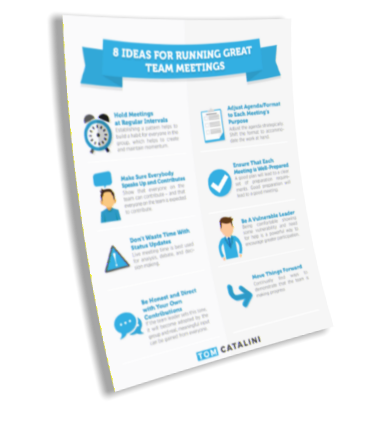 8 Ideas for Running Great Team Meetings! Start building a stronger and more capable team today!